Business Analytics, Second Edition teaches the fundamental concepts of the emerging field of business analytics and provides vital tools in understanding how data analysis works in today’s organizations. Students will learn to apply basic business analytics principles, communicate with analytics professionals, and effectively use and interpret analytic models to make better business decisions. Included access to commercial grade analytics software gives students real-world experience and career-focused value. 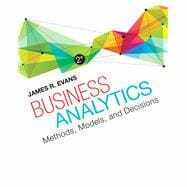 Author James Evans takes a balanced, holistic approach and looks at business analytics from descriptive, and predictive perspectives. James R. Evans is professor in the Department of Operations, Business Analytics, and Information Systems in the College of Business at the University of Cincinnati. He holds BSIE and MSIE degrees from Purdue and a PhD in Industrial and Systems Engineering from Georgia Tech. Dr. Evans has published numerous textbooks in a variety of business disciplines, including statistics, decision models, and analytics, simulation and risk analysis, network optimization, operations management, quality management, and creative thinking. He has published over 90 papers in journals such as Management Science, IIE Transactions, Decision Sciences, Interfaces, the Journal of Operations Management, the Quality Management Journal, and many others, and wrote a series of columns in Interfaces on creativity in management science and operations research during the 1990s. He has also served on numerous journal editorial boards and is a past-president and Fellow of the Decision Sciences Institute. In 1996, he was an INFORMS Edelman Award Finalist as part of a project in supply chain optimization with Procter & Gamble that was credited with helping P&G save over $250,000,000 annually in their North American supply chain, and consulted on risk analysis modeling for Cincinnati 2012’s Olympic Games bid proposal. A recognized international expert on quality management, he served on the Board of Examiners and the Panel of Judges for the Malcolm Baldrige National Quality Award. Much of his current research focuses on organizational performance excellence and measurement practices.